SANTA CLARA, Calif., April 9, 2015 – Intel Corporation today announced that the U.S. Department of Energy’s (DOE) Argonne Leadership Computing Facility (ALCF) has awarded Intel Federal LLC, a wholly-owned subsidiary of Intel Corporation, a contract to deliver two next-generation supercomputers to Argonne National Laboratory. The contract is part of the DOE’s multimillion dollar initiative to build state-of-the-art supercomputers at Argonne, Lawrence Livermore and Oak Ridge National Laboratories that will be five to seven times more powerful than today’s top supercomputers. The joint Collaboration of Oak Ridge, Argonne and Lawrence Livermore (CORAL) will help to advance U.S. leadership in scientific research and maintain its position at the forefront of next-generation exascale computing for years to come. Intel was selected as the prime contractor and will work with Cray Inc. as the system integrator and manufacturer of these next-generation high-performance computing (HPC) systems for the ALCF. 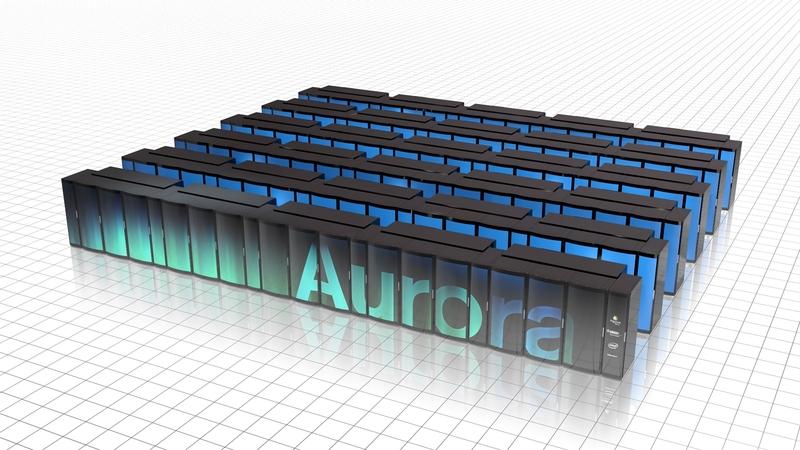 The largest system, to be called Aurora, is based on Intel’s HPC scalable system framework and will be a next-generation Cray “Shasta” supercomputer. The Aurora system will be delivered in 2018 and have a peak performance of 180 petaflops, making it the world’s most powerful system currently announced to date. A second system, to be named Theta, will serve as an early production system for the ALCF. To be delivered in the 2016, the system will provide performance of 8.5 petaflops while requiring only 1.7 megawatts of power. Research goals for the Aurora system include: more powerful, efficient and durable batteries and solar panels; improved biofuels and more effective disease control; improving transportation systems and enabling production of more highly efficient and quieter engines; and wind turbine design and placement for improved efficiency and reduced noise. Contracts valued at more than $200 million are in addition to the recent selections of Intel architecture for the DOE’s next-generation Trinity and Cori supercomputers. Aurora will be based on Intel’s scalable system framework combining multiple Intel HPC building blocks, including future generations of Intel® Xeon Phi™ processors and the Intel® Omni-Path Fabric high-speed interconnect technology, a new non-volatile memory architecture and advanced file system storage using Intel® Lustre* software. The Theta system will be powered by Intel® Xeon® processors and next-generation Intel Xeon Phi processors, code-named Knights Landing, and will be based on the next-generation Cray XC supercomputer. The Aurora supercomputer represents a new architectural direction based on Intel’s HPC scalable system framework. The framework is a flexible blueprint for developing high-performance, balanced, power-efficient and reliable systems capable of supporting both compute- and data-intensive workloads. The framework combines next-generation Intel Xeon and Xeon Phi processors, Intel Omni-Path Fabric, innovative memory technologies, Intel® Silicon Photonics Technology and the Intel Lustre parallel file system – with the ability to efficiently integrate these components into a broad spectrum of HPC system solutions. The framework also provides a ubiquitous and standards-based programming model, extending the ecosystem’s current investments in existing code for future generations. Intel, the Intel logo, Xeon and Intel Xeon Phi, Omni-Path Fabric and Silicon Photonics are trademarks of Intel Corporation in the United States and other countries. 2 The ALCF’s current Mira system delivers a peak performance of 10 petaflops and a peak power consumption of 4.8 megawatts. The Aurora system will have a peak performance of 180 petaflops and a peak power consumption of 13 megawatts.